I am starting a new series on the The Daily Batch! On Tuesdays we’ll look at style icons of different eras and what made their look their own, and how to replicate it for today in a way that is modern and not a costume. Before Salma, Frida Kahlo was the face and the artist to represent the modern Mexican woman. An artist and deeply thoughtful thinker, Kahlo through her work of primarily self-portraits displayed a highly developed style. 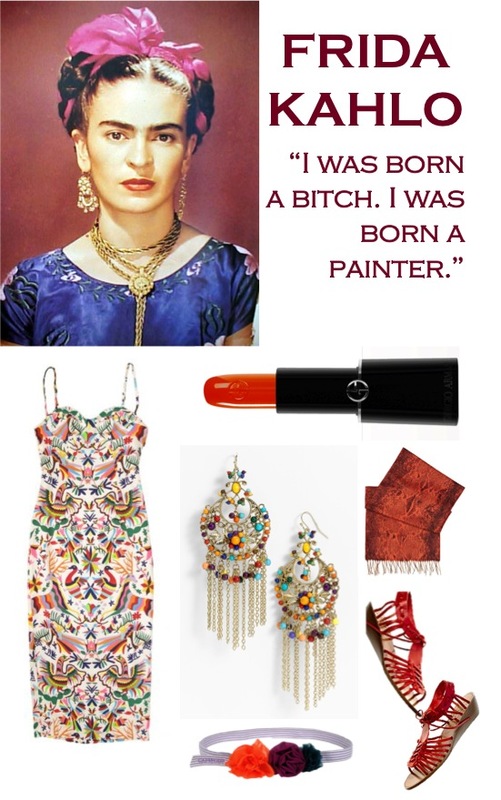 The key to a Frida inspired look: bold colors, slick hair and makeup, heavy jewelry, fabric with rich fabric and movement. This entry was posted in Fashion Inspiration, Her Closet and tagged blazers, fashion icons, frida kahlo style, iconic fashion, Mexican style, mexican trend, style icons. Bookmark the permalink.